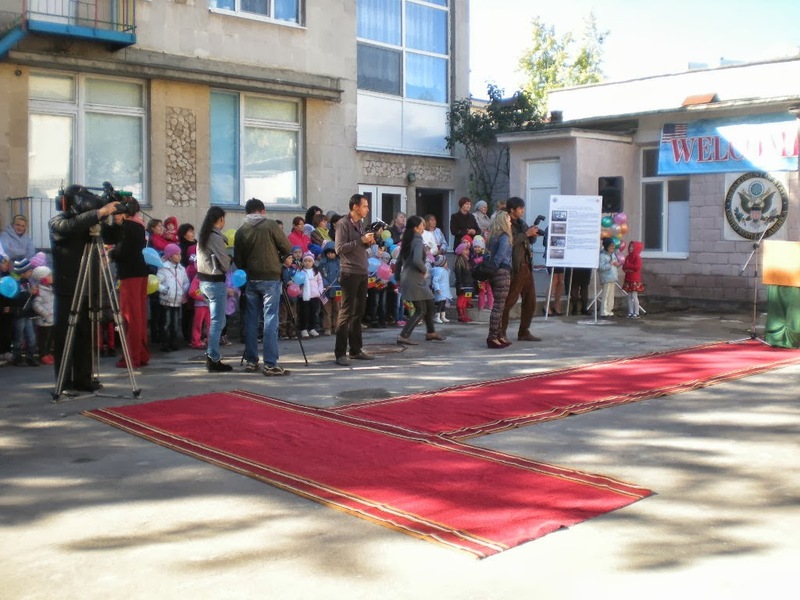 On Friday Sept 27, all of the missionaries in Chisinau are gathered in the school yard of Kindergarten #183 in preparation of the ribbon cutting ceremony that is about to take place. The young missionaries have completed over 110 man-hours of service here painting, raking, sweeping, and cleaning up the school grounds. With preschool and kindergarten children lined up along the school wall with their teachers and parents, Arlana shakes hands and works the crowd. Some of the children don't know what to think about the lady speaking the strange language. Hopefully, Arlana's hands are warm! Some of the children are braver than others. The TV reporter and camera show up and asks for an interview. Fortunately, she spoke good English. I introduced myself and told about what we did here. She asked how we got involved and I explained that. The left four gentlemen are from the American embassy. 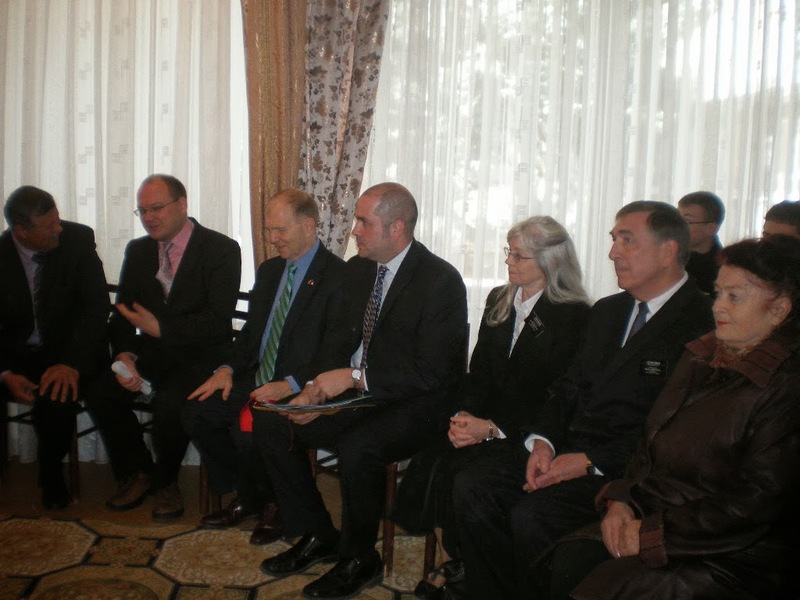 The person beside me translated for the ambassador and myself. The elders beside Arlana speak Russian and English. The other side of the school yard with the TV Cameras and the "welcome" sign. 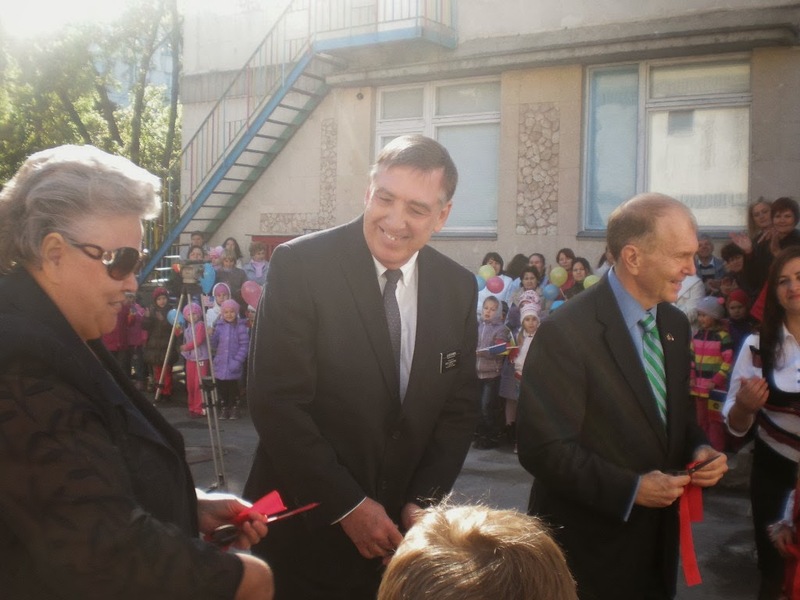 Elder Kneib along with the US Ambassador William H Moser and the Kindergarten Director Ana Teaca cutting the ribbon to the newly renovated kitchen of Kindergarten #183 in Chisinau, Moldova on September 27, 2013. Everybody feels relief when the ribbon is cut and the speeches are done. Inside the kindergarten, we get front row seats for the ensuing program put on by the school staff and students. 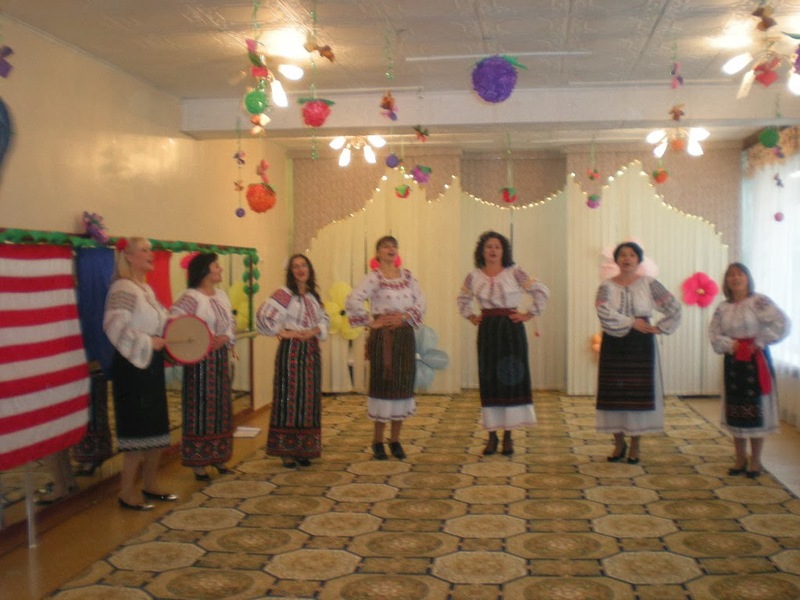 First, the ladies sang some folk songs wearing their native dress. Then, the children took over with several songs. After this, all of the guests and parents went to another room where some refreshments were served. There some of the parents spoke about how grateful they were for all of the work that was done. Arlana and I and our translator then left and spent the remainder of the day processing our applications to get our extended stay visas for Moldova. "This is the 19th Century"